Be More Than A Bookstore: A Brick-And-Mortar Shop's Key To Success Barnes & Noble is experimenting with food, Amazon is replicating its online business and an indie shop aims to be part of the community. Ultimately, they all want to sell more books. 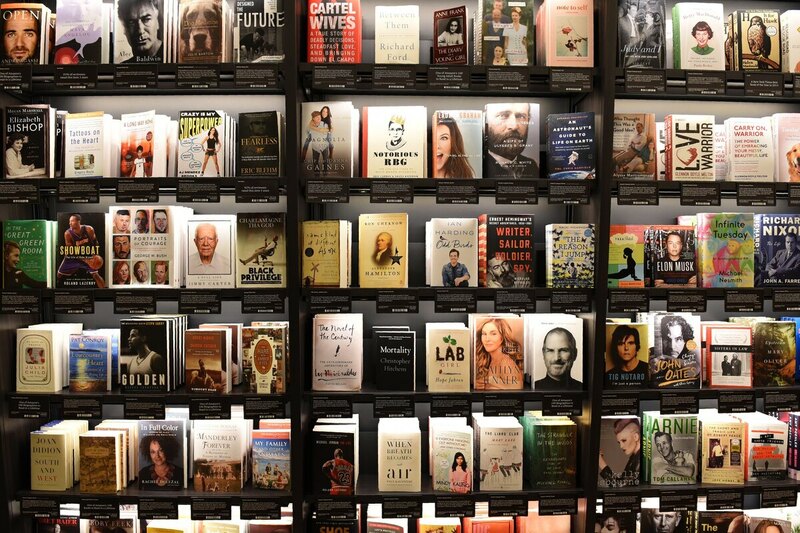 Books at Amazon's New York City store are shelved with the covers facing out and organized around features that originated on the website, including "Most Wished For" and "Customers Who Bought This Item Also Bought." Back when Amazon first introduced the Kindle, and e-books were all the rage, a lot of people thought printed books and the stores that sell them were going the way of dinosaurs. But a decade later, print is outselling digital, and many independent bookstores are thriving. Even Amazon is opening brick-and-mortar stores (seven so far). Its newest is in a high-end mall in New York City. "We call ourselves a physical extension of Amazon," says Jennifer Cast, vice president of Amazon Books. "So when you walk into our front door, what you see is our first table full of books, and it's called 'Highly Rated (4.8 Stars & Above).' "
This isn't a shop where a customer can get lost in the stacks — there are no stacks. Instead, books are shelved with the covers facing out. Cast says the store is organized around features familiar to anyone who has ever bought a book on Amazon, features like "Most Wished For." Those features are based on data collected on the website and on Kindles, and that information is at the heart of the store. "We have so much wonderful information from customers about what they read, why they read and how they're reading," Cast says. "And to be able to surface that in a store to help customers discover books is what we're all about." There's one other very important way the store connects to the website: When customers check an item's price at one of the store's scanners, they're given the list price and the Amazon Prime member price, which in one case was about $15 less. Don't have an Amazon Prime account? You can sign up for one at the register. Amazon's entry into the physical bookstore business could be viewed as a threat to small independents, but Jessica Stockton Bagnulo isn't too worried. She co-owns the Greenlight Bookstore in Brooklyn's Prospect Lefferts Gardens neighborhood. "In so many ways, we're in a different business," she says. "And it seems very much like those stores are trying to replicate the online business, and we are trying to do something completely different." This is the second store Stockton Bagnulo and her partner, Rebecca Fitting, have opened in Brooklyn. Their other store, in the Fort Greene neighborhood, has strong ties with the surrounding community. They hope to build a similar relationship with people in Prospect Lefferts Gardens because, according to Fitting, indie stores that are supported by their local community are the ones that succeed. "People are starting to understand ... that shopping in your community helps you feel more connected; it helps your tax base; it helps make your surroundings more interesting," Fitting says. "And if you don't support that, it goes away." One way the store is trying to build its relationship with the community is with events, including a recent reading and conversation with Mexican writer Yuri Herrera. Author events help sell books and build awareness, and they also create an important role for the bookstore in the community. "In reality, a bookstore is a really unique kind of space where people from different walks of life can cross paths," Stockton Bagnulo says. "I mean, it's a very sort of democratic kind of product, and it's kind of a space where people can come in and start to have conversations. And that's the kind of space we want to be." It does seem like a bookstore has to be more than just a bookstore to succeed. In addition to author events, many stores host festivals and book groups. They have cafes where customers can relax, and some even have full-scale kitchens. At a Barnes & Noble in suburban New York, near Scarsdale, customers can order from a menu that includes ricotta pancakes, kale salad and a salmon entree. The bookstore chain is experimenting with restaurants, and manager Kathie Bannon says so far it has been well-received. "From what I've been able to see and hear from people, they are so happy and so pleasantly surprised that they can add this to their life; they can add this to their routine." The restaurant, which includes an outdoor patio and a bar, opens out into the bookstore. It's designed around a wide open central space surrounded by shelves of books. Bannon calls it the piazza. "There's little nooks and crannies, and people can come and they can get a glass of wine if they'd like and they ... can get an assortment of things that they want to browse through." Barnes & Noble says it is still testing the restaurant idea; it won't comment on whether this is helping sell more books. And that, of course, is the whole point: Whether online or in a physical space, with a full menu or a makeshift seating area for events, bookstores do still revolve around selling books.